Contrary to popular opinion, children's brains can cope with phones and tablets from a very young age yet too much screen time may be causing the type of cortex thinning that is usually associated with a more mature age. The trouble with all those recommendations is that parents themselves are behind screens all the time and kids copy everything they see as they consider this to be the normal behavior. Moreover, if your kid isn't phone or tablet-savvy when that age comes, they now risk falling behind their peers whose parents aren't as restrictive and, let's face it, these gadgets are now an integral part of everyday life for everyone, young and old. Everything in moderation, as they say, and with "high-quality programming," as the American Academy of Pediatrics says. Interactive learning, games, cartoons and everything else that can be done on a phone or tablets' screen is just another aspect of growing up that should be supervised but not entirely banned. As for the vessels that carry that action there are a few guidelines and devices you can follow to pick the best phone or tablet for your kid - just remember, let them hit two years of age at least before you introduce them to the instant gratification that touchscreens carry. 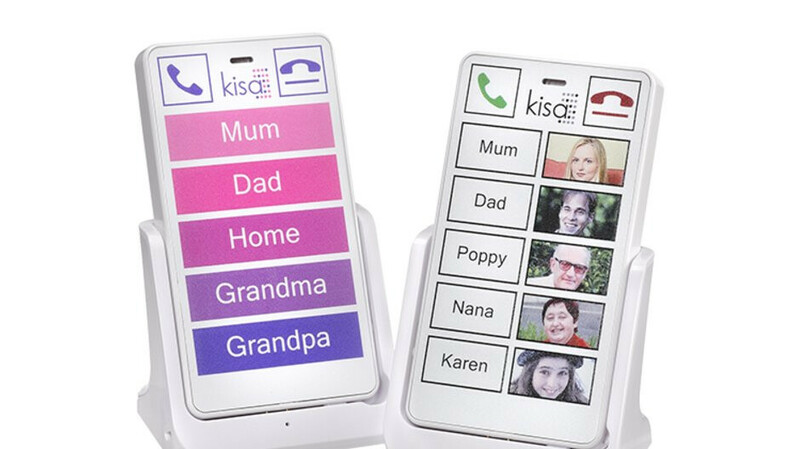 If you want to go all helicopter parenting and concerned with a dedicated expensive device made with toddlers or elderly in mind to soothe your conscience, you can't do much better than the KISA phone. The title stands for Keep It Simple Always, and the handset does just that. It has programmable physical buttons wrapped in a durable exterior whose number and functions when pressed are set by you when you order it. Slap one button for mommy, another for daddy, and one for the neighbors, and you are golden. You can also have information printed by KISA on the back of the phone, for addresses, allergies, medical conditions, and so forth. There is no touchscreen, no apps, just good old physical keys that your kid can push to call when they need to, and a big SOS button on the back to call emergency services. If your child has an independent streak and never calls mommy, the KISA phone is equipped with GPS tracking so you can always know the offsprings' whereabouts, too, making it the ultimate digital umbilical cord without the worries about touchscreens, apps and young brain development. You can tie the KISA phone on a lanyard around your children's necks when they go out to play if your carrier uses GSM/WCDMA 2G/3G 850/900/1800/1900/2100 frequencies, just slip your own SIM card in and go. While it will be a challenge to use the KISA phone with Verizon, America's largest carrier has a suitable handset of its own to offer your little rascals, one with a Sapphire Shield Display that's "virtually scratch proof." Yes, we are talking about a full-fledged Android handset at that, just ruggedized to the 9 and with а 2-year warranty. The Kyocera DuraForce Pro 2 is thicker and heavier than your regular smartphone with a 5" panel, but given how rare phones are phones with less than 6" screens these days, the 5.91 x 2.89 x 0.53 inch (150.2 x 73.4 x 13.5 mm) dimensions are actually a breath of fresh air, and suitable for small hands. Marketed as ideal for "adventure-seeking consumers" plus "business and enterprise use, especially construction, public safety and transportation," we would add kid-friendly to that list. Let your offspring bump, drop, dunk and even hurl the new durable Kyocera, it will take a beating and keep on ticking when they want to watch their favorite cartoon or play a light game, enveloped in Military Standard 810G protection. Priced at $444 outright, or $18.50 a month for 24 months on Verizon Device Payment, the new smartphone comes with fine internals like an octa-core Qualcomm Snapdragon 630 processor, 4 GB of RAM, 64 GB of expandable storage space, and a dual rear camera. These are perfectly worthy of the price tag alone, but the added ruggedness, the manageable size, and the PTT (push-to-talk) button so you can walkie-talkie your little ones, are just icing on the cake. While we are still on the Verizon topic, you can check out the basic Cadence flipper that costs just $120 to keep in touch with your kiddo without breaking the bank and without worrying about this or that app or video they might encounter on the Wild Wild Web. It's a feature phone, so they will be able to call or message from the large keypad, shoot a picture or two, and that's about it - no restriction software, no device management, no crying if the Cadence gives up the ghost prematurely. Moreover, the flipper does what it should best, as it offers both HD Voice and Voice over Wi-Fi, coupled with the dual-mic noise cancellation that aims to remove the background noises around you. Overall, the Cadence is a suitable introduction to the cell phone but not smartphone universe if you are on Verizon already and need something that your kid can use to keep in touch. Priced to move at sub-$200, the Moto G5 Plus is hands down one the best unlocked phone for the money you can currently get in the US, as it would work on all major carriers, including Verizon and Sprint, and our review didn't find any major reasons not to get it at this price tag. It offers fast performance, all-day battery, fine camera, and compact design in this day and age of huge palm wasters. Long story short, your kid will have a full-blown smartphone with a metal body that can't shatter easily like those glass ones and can be hooked to any US carrier, on a family plan or prepaid service. The cherry at the top, however, is the price tag that makes it readily replaceable should the school bully decides to play soccer with it. We kid but the G5 Plus is indeed a great entry-level phone that you don't have to baby, making it suitable for old and young who can use any US carrier service on it. Let's face it, most kids get introduced to mobile operating systems by first, your old phone, and, second - tablets. Another one in the sub-$200 club, the Honor 7X can double as one of the best kids tablets too, as it sports a 6" 1080p display. Here the similarities end, though, as it sports more processing power and memory than your average cheapo Android slate that usually gets tossed as a stocking stuffer by Grandma. With durable metal exterior, fast innards, and inexpensive price tag, the Honor 7X checks most of what you would be looking for in a kid-friendly phone that can by virtue of its huge display double as a mini tablet for watching cartoons or playing light games. Simple phones are all fine and dandy, but given that your kid gets first introduced to the wonderful world of mobile technology via your own smartphone, and in the US that means an iPhone in about half of the households, it might balk at anything else. A discounted new iPhone 7 on a cheap family plan comes to the rescue. Walmart is selling the iPhone 7 (32 GB) for $299.99, and you have the option to buy monthly Family Mobile service starting at $29.88 - that kind of money gets you 1 month of unlimited talk, text, and data (although only the first 3 GB of data are on 4G LTE). Granted, you'll be tied to T-Mobile's network for a year before the phone can be unlocked, and Walmart only has the Gold and Silver iPhone 7 variants in stock, but that's literally a small price to pay for something that Apple now asks two Benjamins more for. We don't need to extol the virtues of iOS and its games app ecosystem now, do we?